NASA’s Solar Dynamics Observatory captured images of Earth and the moon as they crossed the sun. Just before the moon entered the shot, Earth blocked SDO’s view completely. By the time SDO had a clear view again, the moon was just completing its journey across the sun’s face. On September 13, 2015, as NASA’s Solar Dynamics Observatory, or SDO, kept up its constant watch on the sun, its view was photobombed not once, but twice. Just as the moon came into SDO’s field of view on a path to cross the sun, Earth entered the picture, blocking SDO’s view completely. When SDO’s view of the sun emerged from Earth’s shadow, the moon was just completing its journey across the sun’s face. Though SDO sees dozens of Earth eclipses and several lunar transits each year, this is the first time ever that the two have coincided. This alignment of the sun, moon and Earth also resulted in a partial solar eclipse on September 13, visible only from parts of Africa and Antarctica. SDO’s orbit usually gives us unobstructed views of the sun, but Earth’s revolution around the sun means that SDO’s orbit passes behind Earth twice each year, for two to three weeks at a time. During these phases, Earth blocks SDO’s view of the sun for anywhere from a few minutes to over an hour once each day. You may notice that Earth’s outline looks fuzzy, while the moon’s is crystal-clear. This is because—while the planet itself completely blocks the sun’s light—Earth’s atmosphere is an incomplete barrier, blocking different amounts of light at different altitudes. On the other hand, the moon has no atmosphere, so during the transit we can clearly see the crisp edges of the moon’s horizon. 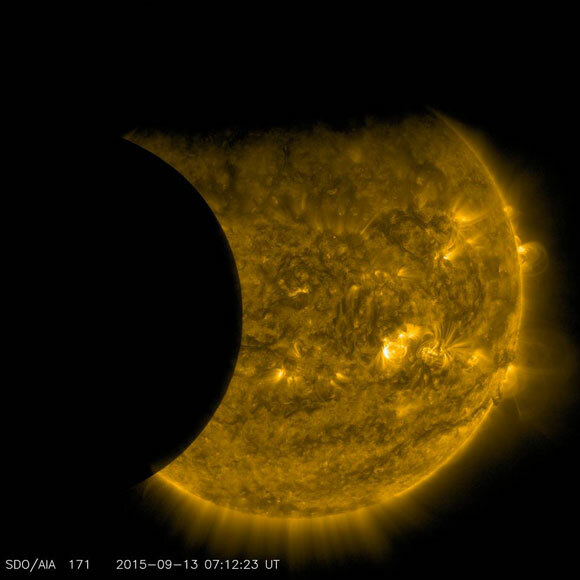 Be the first to comment on "NASA’s SDO Views Earth and the Moon Transiting the Sun"